Maria Montessori became the first woman medical doctor in San Lorenzo, Italy at the turn of the century. She began by working with children with disabilities. When these children began learning various skills, she applied her approach to disadvantaged children in a ghetto in Rome. Her results were so dramatic that her "philosophy" spread rapidly all over the world. In 1907, Dr. Maria Montessori opened the Casa dei Bambini, or Children's House. Dr. Montessori's philosophies were soon published in multiple books. Her work covers in detail, two "planes of development:" the first plane is grouped into ages 0 to 3 and 3 to 6; the second plane is grouped into ages 6 to 9 and 9 to 12. Dr. Montessori outlined the work of the third plane (12 to 18). She also wrote briefly about the fourth plane, ages 18 to 24, in The Function of the University. Dr. Montessori uses universal and fundamental principles to assist in the development of the children and her philosophy can be adapted to any group of children in any culture. Montessori is a continuing and developing system of education with a background of shared experience for over 100 years on all continents of the world through the organization she founded in 1929, the Association Montessori Internationale (AMI). Much of what is considered "new" and "experimental" in education today has long been a part of the Montessori Philosophy. In the United States, Montessori caught on quickly by prominent advocates and overwhelming media attention. Today in America alone, over 5,000 schools use the Montessori Philosophy. Dr. Montessori introduced the concept of observing each child to discover their specific characteristics, learning style and needs. The Children's House Philosophy is based on a 3 year work cycle, with children starting Montessori between age 2½ & 3 years old, and staying until their Kindergarten year, or 6 years old. This allows the teachers to meet each child's individual needs within a structured and nurturing environment over an extended period of time. The teacher can focus on a child's individual milestones by really getting to know each child. 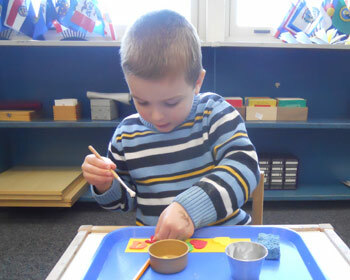 The children "work" with materials developed by Dr. Montessori that meet their needs and developmental milestones. The environment fosters a community atmosphere, where children assist each other and work collaboratively together for the good of themselves, each other, and the classroom community. The teacher presents materials to the children, either one-on-one or in small groups, dependent on the material. The Montessori Classroom, often called The Prepared Environment, allows children the freedom to be themselves, and learn at their own rate, within the limits of a structured environment. A chaotic environment can cause stress, confusion, and frustration to most children. A Montessori classroom provides a safe, calm, peaceful place for children to explore their strengths, work on their weaknesses and learn new concepts. The children develop various skills, such as concentration, gross and fine motor skills, positive social interactions, positive discipline skills and emotional growth, over a period of 3 years. 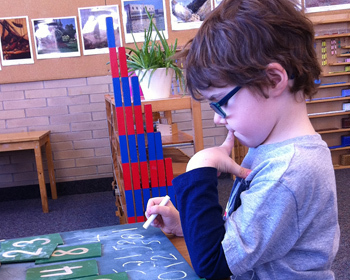 The Prepared Environment is fundamental to the success of Montessori. Each classroom provides the right amount of educational materials to enable a child to work. The classroom is separated into subject areas, Practical Life, Sensorial, Language, Math, Geography & Culture. The children receive presentations on the materials in the classroom, and are able to work on the materials to develop specific skills. 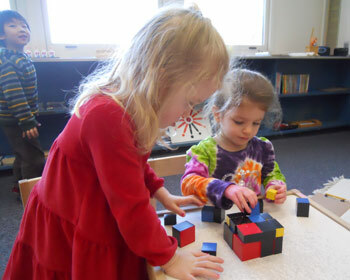 In the Montessori classroom, there is a mixed age group of 2 and half to 6 year olds. This gives the children freedom to work at their own individual pace without fear of competition or criticism. Older children will assist the younger children, which develops self-confidence and positive social interactions. Younger children model the older children, which creates a community of peace and joy while learning academic and life skills. The average teaching ratio in a Montessori classroom is one trained Montessori teacher and one assistant to 25-28 children. Each classroom should have approximately 8 to 10 children per age group (3, 4 & 5/6 year olds), and an even number of girls and boys. Since the Philosophy for the Children's House is based on the child attending for 3 years, each classroom accepts approximately 8 to 10 children a year, and loses 8 to 10 children who graduate to First Grade. Two thirds of the classroom remains the same, which will assist the transition of the new students into the Environment. In addition, rolling admission throughout the year allows children to start the program whenever they are ready, rather than only in September. The trained teacher is able to observe the classroom and guide each child, dependent on their needs and interest level, to the correct materials.